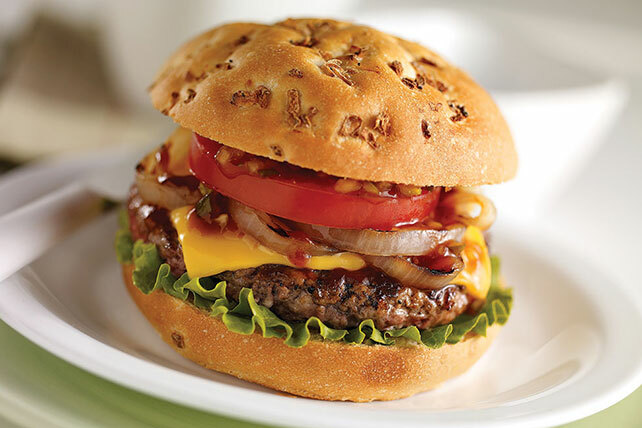 Served in onion rolls, these juicy cheeseburgers are brushed with steak sauce during grilling and topped with grilled onions, tomatoes and a tasty relish. Mix relish and 2 Tbsp. steak sauce. Shape meat into 4 (1/2-inch-thick) patties. Grill patties and onions 4 to 5 min. on each side or until burgers are done (160ºF) and onions are crisp-tender, brushing occasionally with remaining steak sauce. Top burgers with Singles; grill 1 min. or until Singles begin to melt. Fill rolls with lettuce, cheeseburgers, onions, tomatoes and relish mixture. Serve with a fresh fruit salad and small mixed green salad tossed with your favorite KRAFT Dressing. Prepare using a red onion.